Sidney Crosby and Nathan MacKinnon put on a show that made Cole Harbour proud, and it was MacKinnon who walked away with bragging rights for the Nova Scotia town. 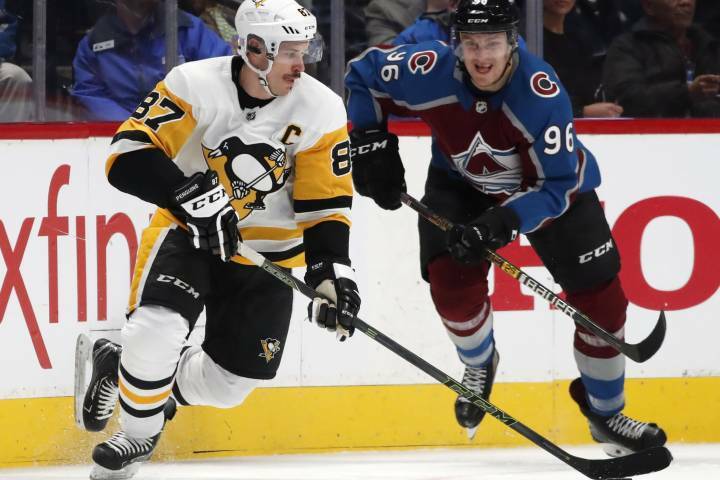 MacKinnon had a goal and three assists, including one on Gabe Landeskog’s tiebreaking score midway through the third period, and the surging Colorado Avalanche overcame Crosby’s natural hat trick to beat the Pittsburgh Penguins 6-3 on Wednesday night. MacKinnon’s team won the matchup of hometown stars, but Crosby nearly stole it with his 11th career hat trick. MacKinnon, 23, and Crosby, 31, are both former No. 1 overall draft picks. They have become offseason training partners and have made TV commercials together. Those things are put aside when they face each other twice a season, but Wednesday’s game might get a second viewing when they get together. The Avalanche’s top line of MacKinnon, Landeskog and Mikko Rantanen, who leads the NHL in scoring with 42 points, had eight points and continues to dominate. Pittsburgh coach Mike Sullivan didn’t hesitate when asked if the trio is the best he’s seen this season. The Penguins challenged Johnson’s goal for goaltender interference but it was upheld upon review. Colorado D Tyson Barrie missed his second straight game with a lower-body injury. … Pittsburgh D Kris Letang, who set a franchise record for games played in Winnipeg on Tuesday, had his four-game point streak snapped. … Colorado is 1-1-1 in the second game of back-to-back sets this season. It is 3-1-0 in the first game. … The first penalty wasn’t called until Crosby drew a holding-the-stick minor 49 seconds into the second period. Colorado’s Alexander Kerfoot got a high-sticking minor 19 seconds later.